Alan, Jose Luis, Jason and father Pepe. Three brothers. All disciplined in the arts. Their westside Albuquerque family home, lies on a half an acre of land that can be deceiving at first glance. The father, greets us at the door. Once inside, he leads us through a small living room, then the narrow kitchen where the boys’ mother shyly stands and softly says, ‘hola’. In traditional mexican fashion they offer us a meal. Eventually, there is an opening to the backyard where two pit-bulls kindly greet us with a sniff of our shoes. “No muerden. They don’t bite,” says the father Pepe Sanchez. The two eldest brothers, 22-year-old Alan and 19-year-old Jose Luis “Güero”, alternate turns pounding a large tractor tire with their respective sledge hammers. Upon, completion of the the typical three-minute round workout, they welcome us. The youngest brother, 17-year-old Jason, coming off his recent participation at the 2012 National Golden Gloves, prefers to watch the brothers train from a distance, and chat with a couple of friends. 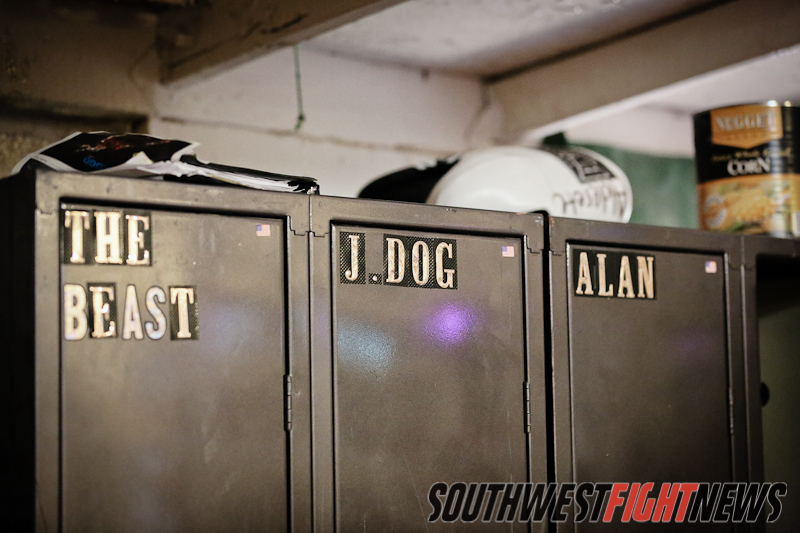 A veteran of four professional bouts, big brother Alan, knows what it takes to prepare for a fight. His training regiment is something Jose Luis, appears to be adopting, his own professional debut will be this Friday at the Route 66 Casino on the Anne Sophie Mathis vs. Holly Holm- The Reckoning undercard. Due to a nagging back injury Alan, has been forced pull out of two huge local fight cards, including the Mathis-Holm rematch. He was looking forward to the idea that he and his brother would share the same stage. The home-gym the family trains out of, resembles one would see in small towns of latin america and looks more like a tool shed from the outside than an actual training facility. A wooden ramp leads you to the elevated structure. It is small, hot but well equipped with all the essentials to craft a fighter. “You can be resting and then when it’s time to train you just go to the backyard,” says Jose Luis of the conveniency. The ring ropes are a cotton cloth dazzled with sparkles. Religious art pieces, Mexico and United States flags, adorn the walls. A flat-screen TV plays a muted novela in the background, as the brothers train to a mixture of music. Vicente Fernandez, first plays but as soon as the radio begins to lose reception it is changed by one of the brothers to a clear frequency that blares rap artist Two Chainz, out of the speakers, displaying the sibilings’ Mexican-Americanness. The father, Pepe, originally from Conterreras, Durango, trained in the art of boxing but never fought professionally. It was his father and an uncle who introduced him to the sport. When first immigrating to the United States he continued with the boxing tradition at a Roswell, New Mexico community center and later passed it on to his children. After a half an hour of loosening up and shadow boxing against their own reflection in the mirrors that surround the ring, Alan and Jose Luis are ready to hit the bags and mitts. Several requests are made by elder brothers but it is not until the father appears to be impatient that they are finally joined by the youngest brother, Jason. His movements appear more fluid than theirs but the strength difference in the other two is evident, seen in the maturation of their bodies. They all train on movable and interchangeable contraptions constructed by their father. He has even created what he calls “portable punching bags” which come in shapes that resemble torso-mannequins and even piñatas. Their purpose are to represent the body of an opponent. He holds the bags, made of tape and paper-mache, out in front of his body stalking his sons around the ring. Pepe, proudly mentions that he has patents on several of these items that can be found spread throughout the room. All three siblings at one time practiced Taekwondo. The trophies and belts for past accomplishments in the Korean art, as well as kickboxing, and boxing litter the gym. The youngest brother Jason, was undefeated in all of his Taekwondo matches but gave it up to pursue the sport his brothers are professionals in. With youth on their side, and a great work ethic, the Sanchez family or as they prefer to be known, Sanchez Brothers Boxing, will be a force to be reckoned with in Albuquerque boxing for many years to come. Tickets to The Reckoning – Mathis vs. Holm card are still on sale and can be purchased here. The show is almost sold out.